The instant New York Times and Wall Street Journal bestseller A groundbreaking plan to prevent and reverse Alzheimer's Disease that fundamentally changes how we understand cognitive decline. Everyone knows someone who has survived cancer, but until now no one knows anyone who has survived Alzheimer's Disease. 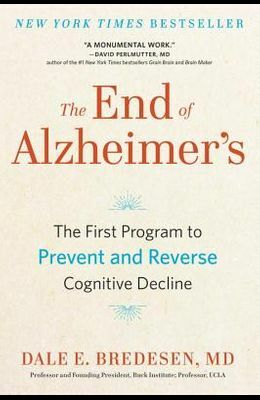 In this paradigm shifting book, Dale Bredesen, MD, offers real hope to anyone looking to prevent and even reverse Alzheimer's Disease and cognitive decline. Revealing that AD is not one condition, as it is currently treated, but three, The End of Alzheimer's outlines 36 metabolic factors (micronutrients, hormone levels, sleep) that can trigger downsizing in the brain. The protocol shows us how to rebalance these factors using lifestyle modifications like taking B12, eliminating gluten, or improving oral hygiene. The results are impressive. Of the first ten patients on the protocol, nine displayed significant improvement with 3-6 months; since then the protocol has yielded similar results with hundreds more. Now, The End of Alzheimer's brings new hope to a broad audience of patients, caregivers, physicians, and treatment centers with a fascinating look inside the science and a complete step-by-step plan that fundamentally changes how we treat and even think about AD.